This Article develops the theme of change/sameness in corporate law. Written to commemorate the thirty-fifth anniversary of Wilkes v. Springside Nursing Home, Inc., the Article argues that the equitable fiduciary duties so central to Wilkes endure today in the close corporation precisely because equity, by its nature, is so exquisitely adaptive – under constantly changing circumstances − to the ongoing pursuit of a just ordering within the corporation. Unlike fixed legal rules – which are categorical, static, and do not take sufficient account of changes wrought by time or human arationality – equity is malleable and timely as it reckons with the flux and gray of business relationships. 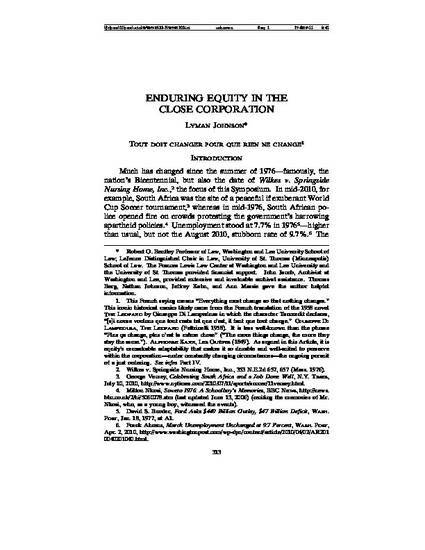 Consequently, equity continues to be necessary in modern corporate jurisprudence, even as it must continually elude law’s attempted subduction by rules. This argument is developed after the Article first places Wilkes in a larger milieu by highlighting similarities and differences between 1976 and the present, and sketching some facts about the city of Pittsfield, the nursing home industry, and the company itself – all of which changed. Lyman P.Q. Johnson, Eduring Equity in the Close Corporation, 33 W. New Eng. L. Rev. 313 (2011).